The Nature Generation seeks to inspire environmental stewards. 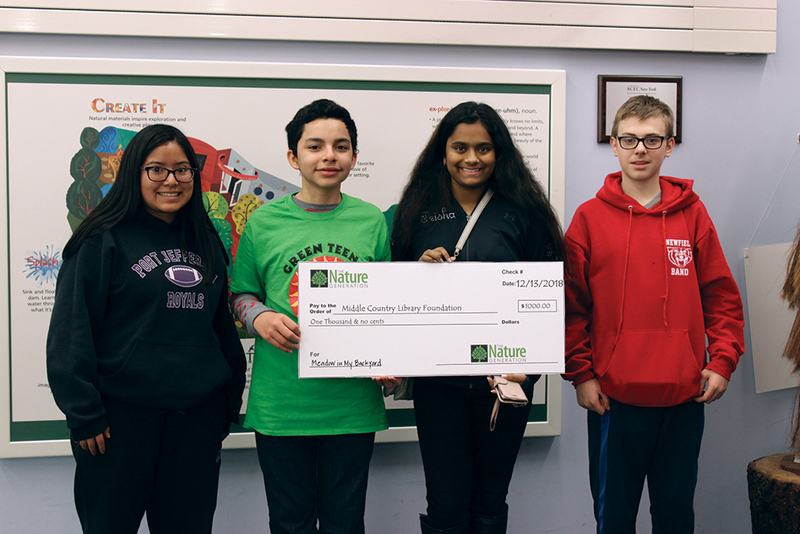 Thanks to a NatGen Seed Grant, MCPL’s Green Teens will launch a campaign to promote backyard nature sanctuaries and wildlife habitats in the community. Through their Meadow in My Backyard project, the teens will communicate to families and young children the idea of transforming a small space or spot of land into a nature garden or retreat. For more information about the programs associated with The Meadow in My Backyard project, contact Kristine Tanzi at 631-585-9393 x230. Pictured l-r: Merixel Ramirez, Brian Corado, Trisha Pal, and Jonathan Hartman.